CVNE (Compagna Vinicola del Norte de Espana) is one of the most renowned and historic bodegas in all of Spain. Founded in 1879 by the Real de Asua brothers, Eusebio and Raimundo, the company has been an integral part of the Rioja region's ascendance in the world of fine wine. 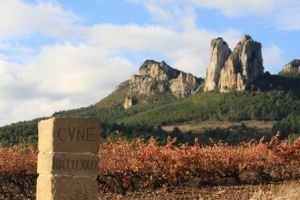 With their combination of traditional roots and innovative vision, CVNE has been one of Rioja's most reliable sources for high quality wine. The company is still run by descendants of the Real de Asua brothers, now represented by the fifth generation with current CEO Victor Urrutia Ybarra.Since its founding, CVNE's goal has been to increase the scope of production while maintaining the level of quality on which their reputation was built. Forty years after the original bodega was created, CVNE expanded into the Alavesa region. Today, CVNE is comprised of three separate bodegas: Cune, Vina Real, and Contino. Each of the three estates produces a distinct style of wine from a distinct terroir, and each of their flagship bottlings occupies a well-deserved place in the pantheon of great Spanish wine.